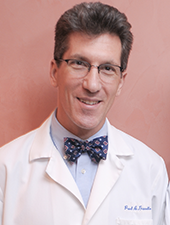 Dr. Paul A. Gaudio is a West Hartford native, and established Eye Disease Consultants in 2003. He was central Connecticut’s first fellowship-trained expert in ocular infectious and inflammatory diseases, and his day-to-day practice continues to center around caring for patients with these diseases. Such care includes specialized medications to treat inflammation while also dealing with the secondary issues that inflammation causes such as glaucoma, cataract, and corneal scarring. Many of these problems require complex corrective procedures or surgery, which Dr. Gaudio regularly performs. Dr. Gaudio is a frequent lecturer and instructor at local and national ophthalmology conferences, and a clinical faculty member at the Yale Eye Center, with extensive experience teaching ophthalmology residents. Many patients seek his input for vision-threatening diseases, often discouraged after difficult experiences elsewhere. By far the most rewarding part of Dr. Gaudio’s work involves discussing these patients’ conditions with them, explaining or educating where necessary, and reassuring nearly always that these problems are treatable and visual loss can be avoided. Dr. Gaudio lives in West Hartford with his wife and 3 children.